At Uber Freight, we aim to make payments as clear and simple as can be. That’s why when carriers search for loads, we show the price upfront on every single load. That’s also why we pay carriers in just a few days with no extra fees. But what happens when things don’t go as planned? 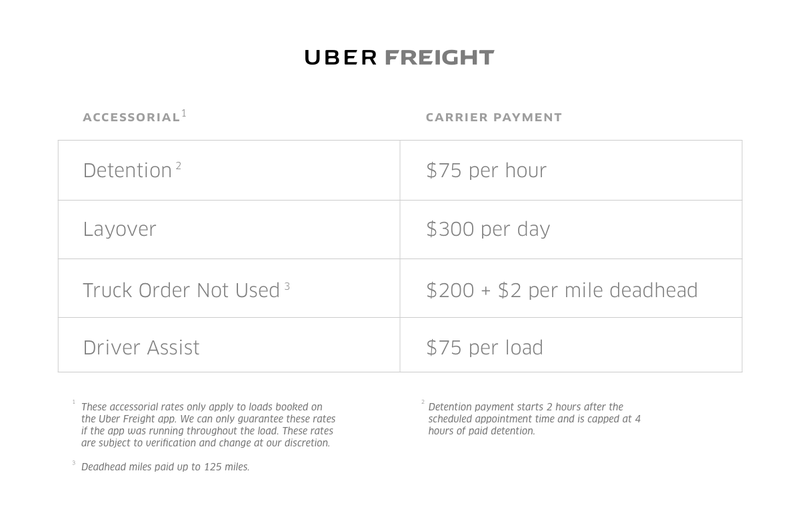 We want our carriers to know Uber Freight has their back when it comes to accessorial charges too. We are publishing our accessorial rates so that our users know what they can expect when they take an Uber Freight load. Now there’s a few things to know about the rates above. First, if there are extraordinary circumstances that don’t neatly fall into one of the categories above, email us and we’ll work it out with you. Second, you have to be using the app for us to guarantee these rates. The app’s GPS helps us track what’s going on with the load, and it helps us prove to our shippers when you arrived at the facility. If you have any feedback for us on these rates or on the app, don’t hesitate to reach out by emailing freight@uber.com. *Accessorial Table was updated on 6/28/17 to reflect more details.